Danielle Benoit, Ph.D., associate professor in the Department of Biomedical Engineering, Rudi Fasan, Ph.D., associate professor of Chemistry, and Ben Frisch, Ph.D., a research assistant professor in the Department of Medicine, Hematology/Oncology, are working together to improve the treatment of acute myeloid leukemia (AML), one of the deadliest types of blood cancers because it often relapses after initial therapy. They each bring a different scientific discipline and a distinct role to the project. 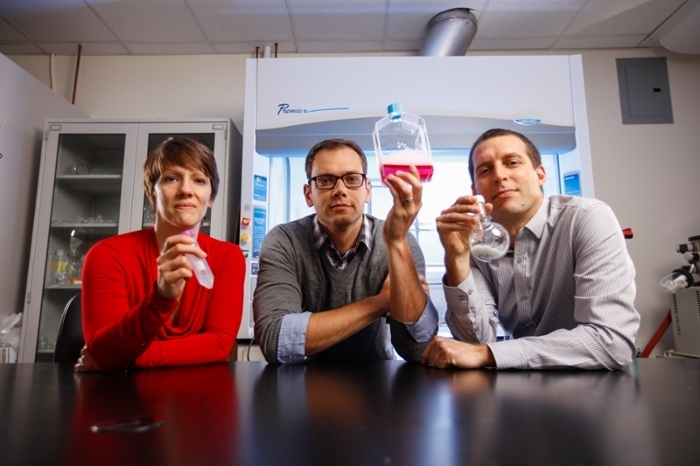 Fasan develops new drugs and new methods to make them more effective. In this case, he discovered and modified a small-molecule anti-cancer drug derived from a natural plant source related to the magnolia tree. After testing several different chemical forms of the compound, he is studying the correct potency and ability to precisely destroy cancer cells. 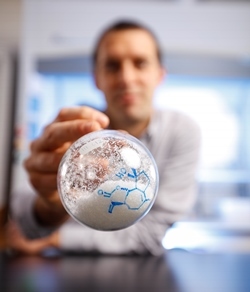 Professor Benoit’s nano-delivery system can transcend the barriers that sometimes prevent drugs from reaching their target. Nanoparticles are microscopic materials that act as a bridge between different structures—in this case the nanoparticles are designed to encapsulate an oily drug compound and make it more compatible with the body’s water. Her system also packages the drug with peptides (amino acids) that direct the treatment into the bone marrow, where leukemia takes root. This article was originally published in Dialogue, the Wilmot Cancer Institute magazine.